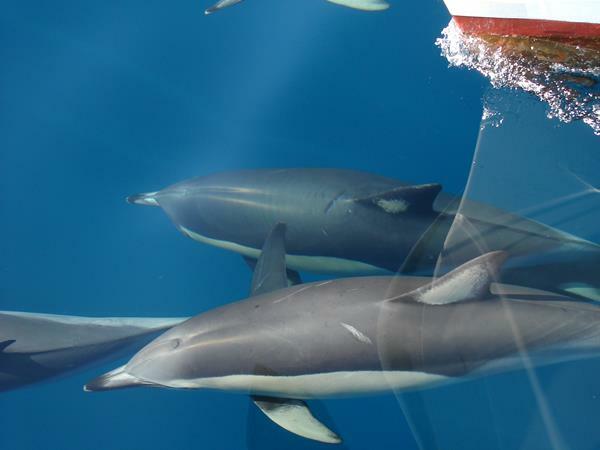 On a Dolphin Blue tour we not only observe but also give you the chance to swim with a pod of dolphins. Keep in mind however that if a pod has baby dolphins with it, our concession (as with all the other operators) does not allow anyone to swim with them. Those who choose to get into the water are supplied with wetsuits and snorkelling equipment and are fully supported by our experienced crew. Day-trip numbers are limited to 15 so that your interaction with dolphins and other marine life is greatly enhanced. This ensures your experience is peaceful and unhurried. Another option available is private charter - for those wanting Commander I exclusively for swimming with dolphins, special occasions, a business get-together, or hosting important guests. Call us about private charter hire rates. We do travel outside Tauranga harbour to find dolphin. This means we will be in the open sea, where conditions are not as calm as would be if cruising in Tauranga harbour. Keep this in mind when preparing for your trip. You may consider taking seasick pills before your tour commences - they are most effective when taken prior to the start of a tour however keep in mind some brands do make you drowsy. Check with the pharmacist. Safety is paramount onboard Commander I and we offer lifejackets to all passengers. Dolphin are not predictable, they are not in the same place every day at the same time! Patience is required in locating them and this may take a good part of the day. If we do not sight any dolphins or whales on a tour, you will be entitled to a free return trip in the same season. Have you ever looked into the eyes of a dolphin? It’s said to be a life-changing experience. At Dolphin Blue, we not only observe but also give you the chance to swim with a pod of dolphins! Those who choose to get into the water are supplied with wetsuits and snorkelling equipment and are fully supported by our experienced crew. Commander I can be hired on a private charter basis for groups of 15 or less. You and your friends, family or work colleagues can relax onboard and we'll take you on a cruise to find dolphins. If the circumstances are right we'll get you in the water to swim with them. Due to weather conditions or other unforeseen circumstances cancelation sometime occurs. We will reschedule cancelled trips; however if you cannot make the rescheduled trip a full refund will be given. •	Your credit card will be charged with the full amount. •	Bookings made through the information centre will receive no money back. •	Your credit card will be charged with 50% of the full amount. •	Your credit card will be refunded the full amount. All transactions are billed in NZD.